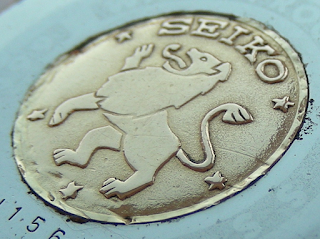 3-pointed star inside a triangle for Applique Dial (AD) Seiko logo. Caseback: threaded, 18k Gold Lion “chronometer-grade” medallion. A mechanical chronometer watch is a spring-driven escapement timekeeper, tested and certified to meet certain precision standards. Chronometers often include other innovations to increase their efficiency and precision. Grand Seiko Chronometer grade watches are characterised by relatively unadorned hand-screened and-assembled movements regulated by specially selected and trained watchmakers. The official chronometer authority for each member country authorized to issue the title of "chronometer" is under the supervision of the Commission Internationale des Controles Chronometriaues (CICC). Any country recognized by the CICC, and testing in accordance with ISO3159 may issue certificates for chronometers. 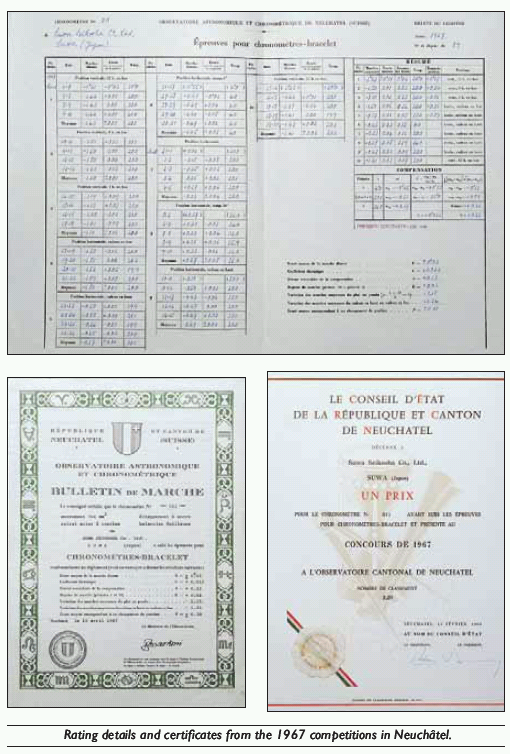 In Japan, the JCA (Japan Chronometer Association) issued chronometer certificates from 1969 to 1983. For Swiss watches, only timepieces certified by the Contrôle Officiel Suisse des Chronomètres (COSC) may use the word ‘Chronometer’ on them, although COSC does not have a monopoly on certified chronometers. 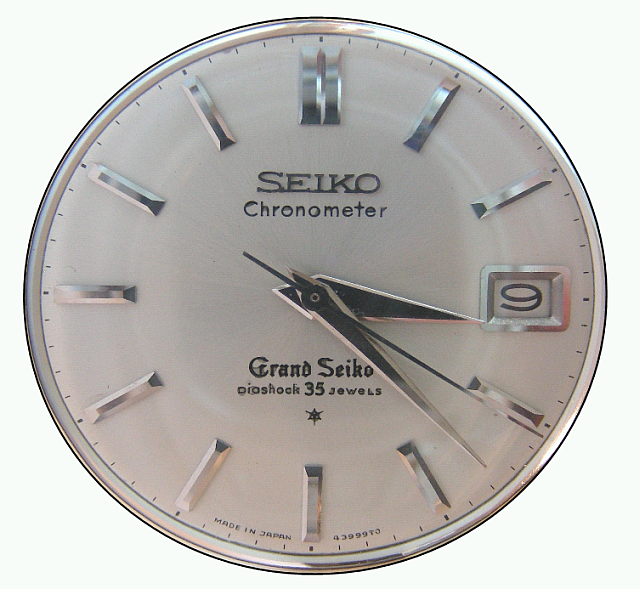 Accordingly, in the early 1960s Seiko displayed the 'Chronometer' name on selected, precision watches which had passed the in-house Seiko chronometer standard testing, the equivalent of the BO (Basel Observatory) Chronometer standard, but stopped displaying the ‘Chronometer’ designation in 1966 due to the lack of independent CICC Certification facilities in Japan. During the early part of this period the 18k Gold Lion medallion was used on the caseback to denote “chronometer-grade” pieces. When the CICC-recognized JCA (Japan Chronometer Association) was established in 1969 in Japan, a few movements designated "Chronometer Officially Certified" appeared. However, under Tsuneya Nakamura, the Seiko team had developed the Grand Seiko Standard: initially the original “AA Grade” or “Grand Seiko (GS) Standard” accuracy followed the same standard as the BO (Basel Observatory) Chronometer standard, subsequently the Grand Seiko Standard became more stringent (and included a 6th regulation position) than any existing Chronometer certification standard. Today, precision Seiko watches displaying the simple ‘Chronometer’ designation are a rarity sought after by collectors, and perfectly reflect Seiko’s “finest decade” – encompassing the introduction of The Grand Seiko Standard and Seiko's victory at the Astronomical Observatory Competitions. In the 1960s, the Astronomical Observatory Chronometer Concours in Neuchatel, Switzerland precision tested and ranked the finest chronometers in the worlds most prestigous chronometer competition. In 1964 SEIKO entered the contest and secured a 144th and 153rd place. In light of this, the 1964 second generation Grand Seiko Chronometer presented here seems particularly refined and unassuming compared to the audacity of Seiko taking on the Swiss watch giants at their own game on their “home-turf”! It bears mentioning that already in 1964, Seiko was producing movements of such precision that they could even consider competing them against the finest chronometer movements in the world. 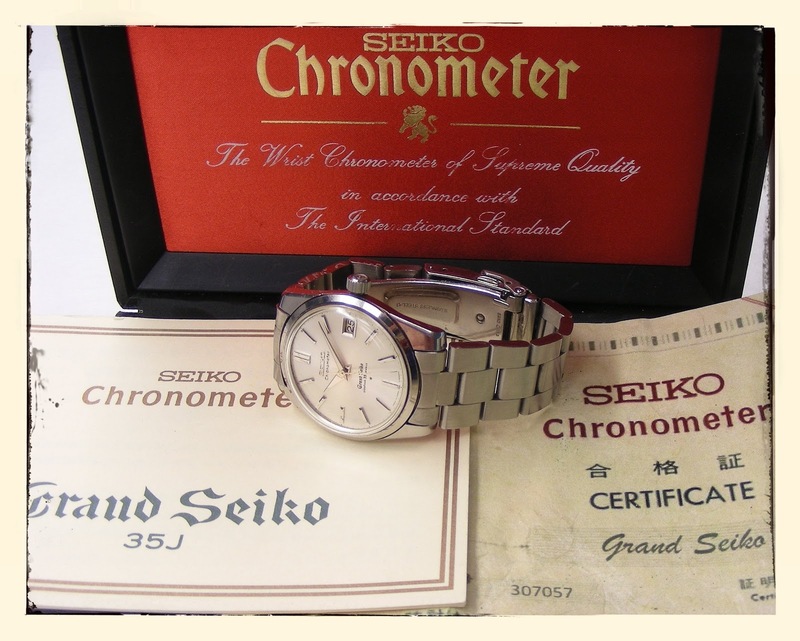 In 1967, a mere three years later, SEIKO secured 4th, 5th, 7th, 8th and 12th place in the Chronometer Concours, winning 2nd and 3rd place in 1968. In 1969, with the advent of quartz movements, the Observatory contests of Neuchatel ended. It is particularly impressive to note that it was Seiko who astonished the world by introducing the first commercial quartz wristwatch, at the same time their Grand Seiko chronometers where redefining the definition of accuracy and precision for superlative mechanical watches! Japan hosted the 1964 Olympics, and the eyes of the world were upon them as Japan attempted to highlight the technological advances made since the Second World War. 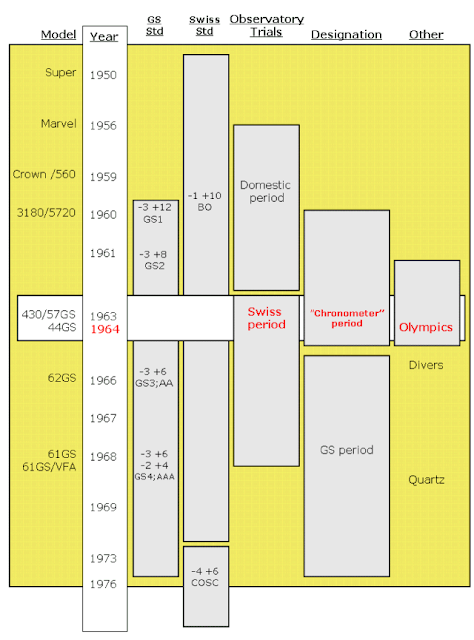 These were the first Olympic Games televised in colour and transmitted live via satellite to North America and Europe, commercial opportunities were huge, and no-one could have felt the pressure more than Seiko, who were responsible for the timing of all events. Remember, this was the year when Seiko for the first time entered the Astronomical Observatory Chronometer Concourse in Neuchatel, Switzerland and secured a 144th and 153rd place amongst the worlds finest chronometers! From the decision in 1960 by Seiko president Shoji Hattori that Seiko would “handle official timing duties”, Seiko’s engineers had only four years to be awarded the contract and develop the technology to become the Official Timer of the Tokyo Olympic Games. The 1964 second generation cal.430/43999 Grand Seiko Chronometer presented here has a serial number of 4NXXXXX (November 1964) suggesting that it was possibly being assembled during the actual Games, which took place between October 10 and October 24, 1964. 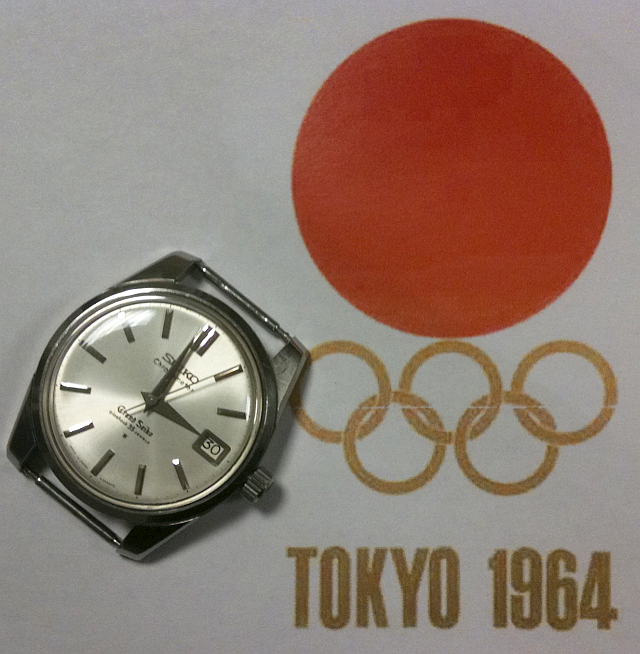 Seiko timed the games flawlessly, and their success at the 1964 Olympic Games gave Seiko international respect and credibility. 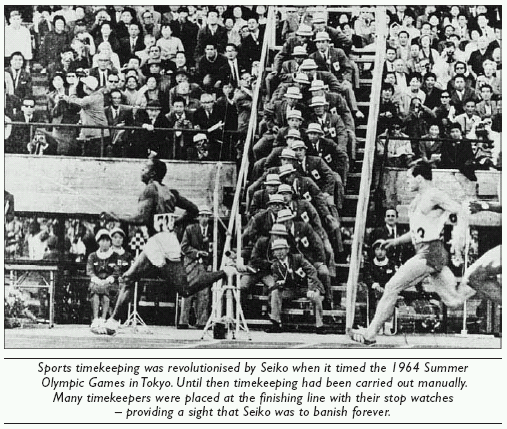 The following is an attempt to summarise the period that can be considered Seiko’s “finest hour” – encompassing among others the introduction of The Grand Seiko Standard, Seiko’s success at the Tokyo Olympics and Seiko's victory at the Astronomical Observatory Competitions. In 1956 SEIKO introduced the “Marvel”, the most precise wristwatch they had ever built. This was followed by the “Crown” in 1959, which ushered in the 1960s – a decade which can be considered Seiko’s “finest hour” – encompassing among others the introduction of the Grand Seiko Standard, Seiko’s success at the Tokyo Olympics and Seiko's victory at the Astronomical Observatory Competitions. Seiko’s 1960 first generation Grand Seiko cal. 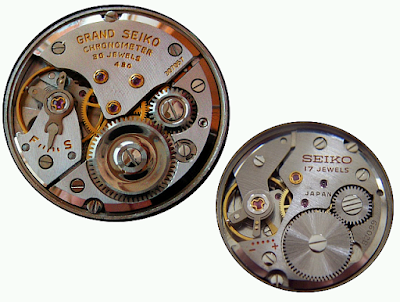 3180 was developed from the "Crown" movement, and encompassed a hand-wind 18000 bph 25j movement with a Grand Seiko Standard specified rate of -3 to +12 s/day, improved to -3 to +8 s/day in 1961. The 1964 second-generation cal.430/43999 Grand Seiko Chronometer presented here is an original low-beat (18000bph) chronometer, superseded by high-beat (36000bph) and VFA (very fine adjustment) chronometers developed following Seiko’s international successes at the Astronomical Observatory Chronometer competitions. The present watch is of contemporary dress size at 38mm diameter and constitutes a timeless design which is carried through in the modern hand-wind Grand Seiko. The present watch contains a chronometer-grade cal.430 movement defined by hand-selected components, fine regulator, self-compensating hairspring (reference needed), generous jeweling and large balance. The cal.430 movement is termed “self-dater” because it has quick set date function. The date function is jewelled, as is the barrel bridge and mainspring barrel. The large balance sports Seiko’s Diashock set-up, as well as Diafix jewels for all bearing points on the GS's train bridge (including the hour and minute wheels). 35 jewel Chronometer grade cal.430 (left) with fine regulation and multiple diafix jewels comprising selected, hand-assembled parts, compared to contemporary cal.6602 handwind movement (right). The movement, produced by Suwa, is 12 lignes in diameter and runs at a low beat of 18000bph. The "tadpole" fine-adjuster was retained for the 5722A (the relabelled 430). Finishing is excellent, with no unnecessary decoration, but the care taken with finishing the individual working components is immediately evident. Winding is firm yet very easy, and adjusting time and date occurs with a precision which again is evidence of the excellent fit and finish of this superb movement. The date flips over with a satisfying click almost exactly at 12pm. The cal.430 movement is cased in a heavily-lugged stainless steel case with threaded caseback and is waterproof to 50 meters. 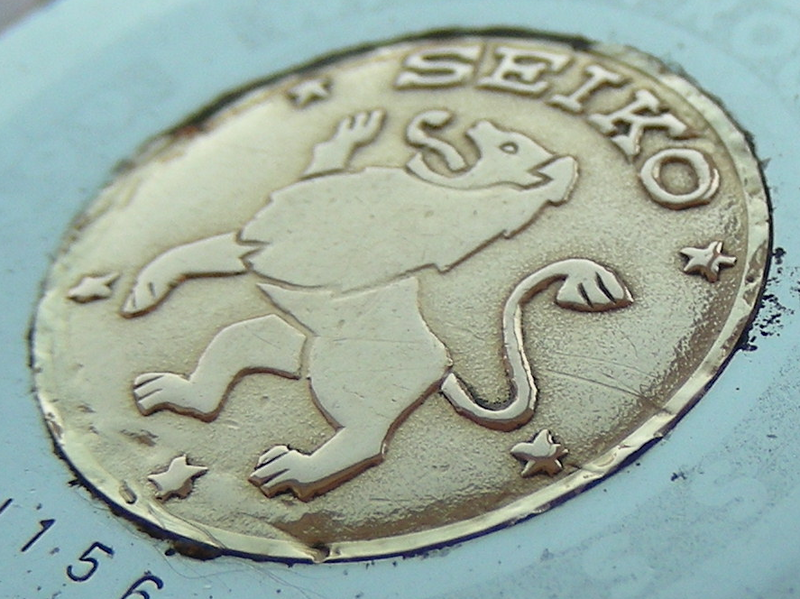 The case-back shows the original 18k Gold Lion medallion used to denote “chronometer-grade” pieces. This was subsequently replaced by a "GS" emblem for the cal.5722 models. The present watch is characterized by an original pearl silver sunburst dial with faceted, applied steel markers and subdues legends, and sports highly readable, faceted “bamboo-shoot” hands. 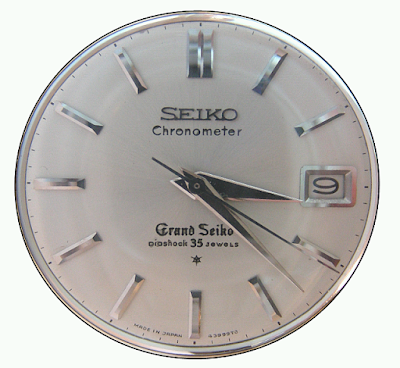 The dial is signed "SEIKO Chronometer, Grand Seiko, Diashock 35 Jewels" and "MADE IN JAPAN, 43999TD" It has a Applique Dial (AD) symbol on the dial - a 3-pointed star inside a triangle indicating the Seiko logo is applique rather than printed on the dial. Later versions of 5722 did not retain the "Chronometer" dial legend, due to the lack of independent CICC Certification facilities in Japan. In 1965, Seiko´s first model diver (62MAS) sold for 13,000JPY, approximately half the monthly wage of a Japanese college graduate. By way of comparison, the precursor sport/waterproof 50m Silver Wave 6201B (1960) cost 11,000JPY while its lower-spec successor, the 6601-7990 30m Sportsmatic Silverwave sports diver cost about 8,200JPY. At this same time the GS 5722 cost a breath-taking 27000JPY. Today, 62MAS divers are selling for 500 to 1000USD, while GS430/5722’s are selling for 1000-2000USD, depending on condition. For this price you are buying into an unbroken legacy of watchmaking, and historically significant pieces like the vintage Grand Seiko’s can only continue to increase in value with the recent internationalization of the Grand Seiko line. Guide to Seiko Men's 1958-1964 Mid/High Quality Mvmts. Grand Seiko. 50 years of dedication to perfection. 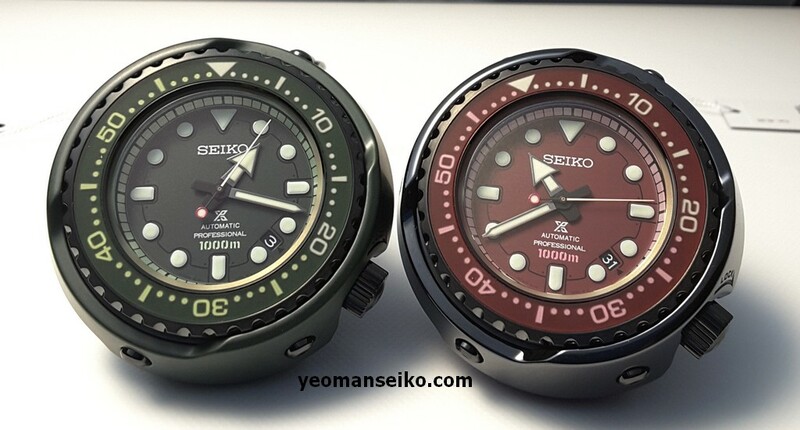 HOW TO BUY SEIKO´S FIRST DIVER - 6217-800x "62MAS"
Weekend Round-Up: Seeking Status, Swine Alive(ish), And A Custom Berluti 911 - Grab a handful of cheap, egg-shaped chocolates and dig into some of our favorite stories from the past week.